Catcher: Erik Kratz, 31, Kratz, a 2010 IL All Star was a key member of the team last year, hitting .288 with 15 HR and 53 RBI. Tuffy Gosewisch, 28, had a very good season for Reading last year. His strength continues to be his defense, however, he provided some punch at the plate last year hitting .247 with 13 HR and 66 RBI. Pitcher Nicholas Hernandez will start the season on the DL and OF Zach Collier is suspended for the first 50 games of the season. * The deception people talk about is very real. Though he’s not the wiry skinny kid he was when he was drafted, he still creates a lot of funk with his arms and legs in his delivery, and some of the hitters took late, defensive swings because they weren’t able to really see the ball. * His location wasn’t great, and he did miss up a few times, which we’ve heard about before. * His slow curveball was in the low 70s and it did not look like a swing and miss offering. Definitely the big thing he’ll need to work on this year. * He threw one or two solid changeups, a weapon he’ll need against lefties. Nothing in his performance really changed my opinion of him. Because of the deception he creates, I think he will be able to generate swings and misses at the next level. I do think his future is likely in the bullpen. Tyler Clippard has proven you don’t need to throw 95 mph to be a successful short reliever, and he gets by with deception. Rodriguez is going to need to tighten up both his changeup and curveball significantly to get to that point, but I think he does have that potential. * What struck me about Bonilla is how calm the first part of his delivery is, as he stays compact until his arm crosses his body, but his follow through is really violent, and he ends up falling off the mound to the first base side almost every time. This is going to cause command problems. * His fastball was generally 90-92 from what I saw, I think I saw one 94. He has average or better arm strength. * Like Rodriguez, his command was pretty poor, probably a case of nerves. He gets a pass. * He threw a couple of really wicked changeups with excellent tumble and fade away from the lefthanded hitters. I believe he also hung one that got belted. * His breaking ball was fringy, but he threw mainly fastballs. I should have tivo’ed the game so I could have tried to capture the video and post it here, but this is from memory. If anyone else watched them pitch, please share your thoughts. We won’t have Matt Rizzotti to kick around anymore as the 26 year old Designated Hitter was traded this morning to the Minnesota Twins for cash considerations. Rizzotti, the Phils 6th round pick in the 2007 draft was certainly one of the most discussed players over the last several years here at Phuture Phillies because of his ability to hit and do little else. The trade will give him the opportunity to do just that in the American League. The Phils made the surprising decision to have RIzzotti repeat AA after an outstanding year in 2010 at the plate for the RPhils. Rizzotti again had a very good year in Reading in 2011 hitting .295/.392/511 with 24HR and 84 RBI. However as a liability in the field, it became apparant that the Phils felt there was no room in the organization for him. Always gracious with his time and a very good guy….Good Luck Matt. The end of an era. Goodnight, sweet prince. This post will provide a brief summary about the new names seen on the minor league work groups this spring. 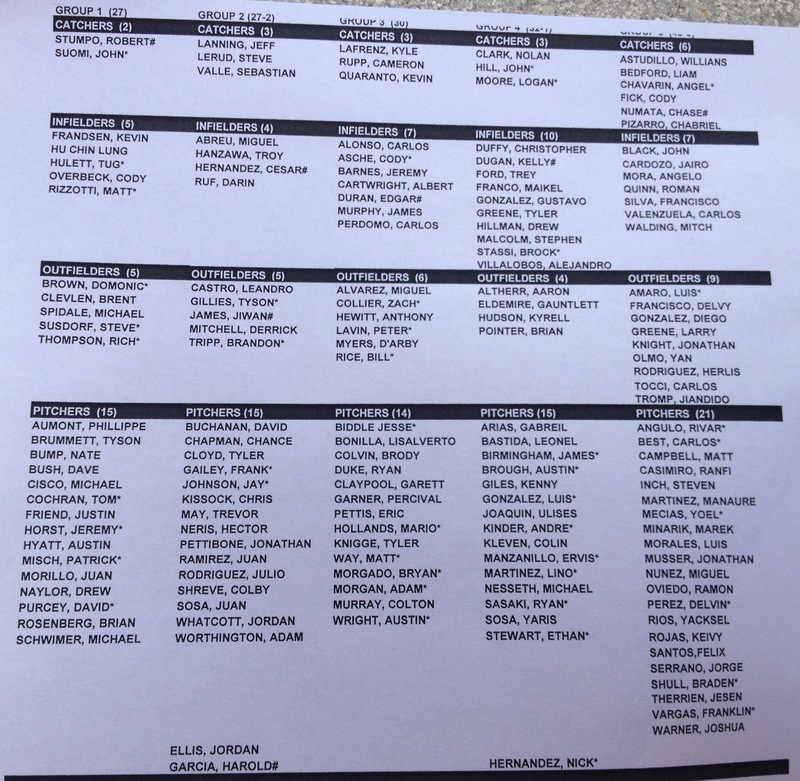 There are more than 20 players on the minor league spring training rosters that are new signings or who played last year in one of the two Latin American complex leagues (the DSL and VSL). Courtesy of loyal reader Bill. Click this link. The regular season is almost here. A few roster spots are up for grabs. Talk about the things that interest you here. And be good to each other, we’re all on the same team.